"Rather than evaluating the implementation or effects of affirmative action, Warikoo interrogates what it does: how does affirmative action in admissions factor into elites’ understandings of race and merit? The book is a timely and crucial intervention, given the recent course of affirmative action politics and the scholarly knowledge we have accumulated to date." "Warikoo (Harvard Graduate School of Education) acknowledges that elite institutions of higher education commit resources to diversifying their student bodies, yet fall short of their goals with respect to race and class. While admissions offices and enrolled white students value affirmative action and diversity, they do so because they feel much is to be gained and learned by diversifying the collegiate way of life. That the numbers of underrepresented minorities in the student body fall short of their relative percentages of the population does not occur to them as a problem, for two reasons. First is faith in the concept of merit. Second is the conviction that the admission process is fair. Thus, admitted students ascribe this distinction to individual merit and are thereby willing to accept some affirmative action so long as it personally benefits their own college experience. This is the diversity bargain. But demographic realities raise the question as to what merit is and how it can be redefined to ensure that all sectors of the population can access the opportunities that society offers. The author distinguishes between symbolic and real solutions and has several suggestions for next steps. A sophisticated contribution unobtrusively informed by current theory and distinguished by substantial field research at Brown, Harvard, and Oxford. Highly recommended." "Elite university students have the prospect to be future leaders and to shape policy in our global society. As Natasha Warikoo notes in The Diversity Bargain, these students’ ideas about race and meritocracy provide us with glimpses into the future as well as reminders of ongoing debates around affirmative action. Drawing upon interviews with students from Brown, Harvard, and Oxford, the author details their interconnected 'race frames'—interpretive ideas about the role of race in elite universities and society more broadly—and the prevalence of color blindness, a common frame and ideology surrendering race and racism to irrelevancy in the present day." 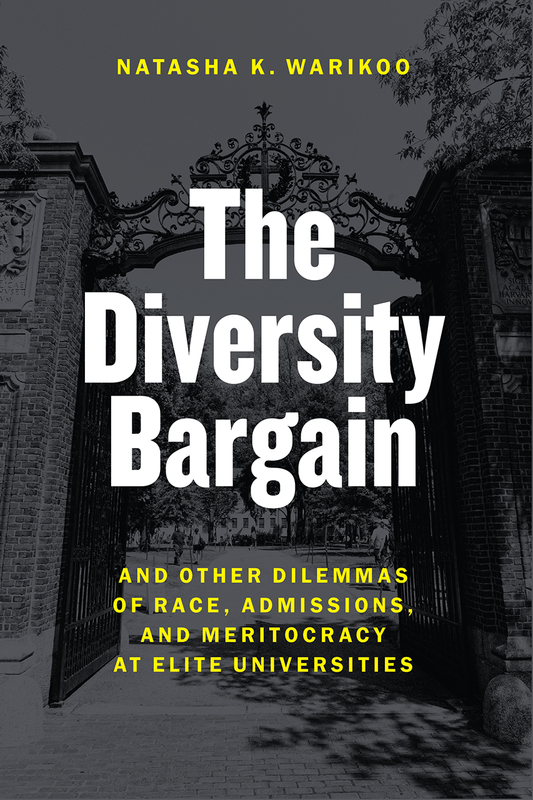 "[Warikoo] artfully incorporates research that exhibits the structural inequalities that exist for racial and ethnic minorities throughout her book....The Diversity Bargain offers a fresh and incisive perspective on one of the most heated and enduring social justice issues of the twenty-first-century." "[A] tightly argued account of contemporary student attitudes about race." "Students at elite universities may see themselves as 'winners,' but even they at times need to rationalize their elite status. That Warikoo shows us how a concept of diversity is recruited into a meritocratic justification is The Diversity Bargain’s main contribution to higher education studies." "A timely and crucial intervention, given the recent course of affirmative action politics. . . . A carefully constructed, incisive book. It stays true to the empirical data to develop smart, accessible, important findings." "Warikoo’s investigation is rooted in a long sociological tradition of understanding the culture of privilege among “power elites.” While more attention has been given as of late to the racial attitudes and beliefs of members of nonelite groups, understanding how college students at institutions, such as Harvard, Brown, Oxford, and Cambridge, articulate an understanding about race is important precisely because it is these young people who are most likely to end up in positions of power. Warikoo makes a cogent point when she insists that elite colleges and universities have symbolic meaning, influencing the policies and practices of other institutions." "If evidence were needed that tomorrow’s leaders do not enter college with the racial knowledge they need to guide the United States and United Kingdom through a turbulent time in our racial histories, The Diversity Bargain provides it. The book shows that white nationalism is not required to protect systems of white supremacy in ostensibly democratic societies. All it takes is leaders turning a blind eye to the pervasiveness of antidemocratic frames that quietly reinforce racial hierarchies." Annette Lareau, University of Pennsylvania, author of Unequal Childhoods.